When filling an area of embroidery, we usually think of fill stitches like the basic satin stitch or long and short stitch. 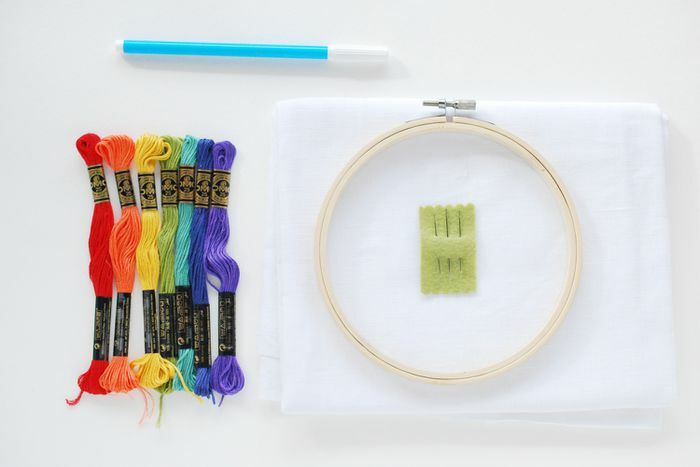 Another way to add lots of color to your stitching, without lots of labor, is to use a technique known as embroidery tinting. The idea is to fill an area by coloring the fabric behind the embroidery. Usually, this means that only the outline is embroidered, with some details added. However, tinting isn't only for coloring inside the lines. Many artists use this technique to create spectacular backgrounds, borders, and accents for their embroidery work. There are lots of ways to tint your fabric for embroidery, with the most common being crayon tinting. In this post, you'll learn a few methods to try. With all of these versions of tinting, it's best to add the color before you start stitching. While it's possible to add the tinting after your embroidery is finished, it's much harder to color all the way up to the lines and without getting markings on your thread. Using crayons for tinting embroidery is the most common technique. It's easy to learn and most people have at least a few crayons around. Crayons produce a bold color, but you can also work more gently with them, resulting in a lighter tint. Just like coloring on paper with crayons, varying the amount of pressure and layering your coloring creates some very cool shading. That shading gives your embroidery texture and dimension, and it's fun to use with modern or vintage designs. To crayon tint, your embroidery, start by transferring your design to the fabric. I recommend using a finely sharpened regular pencil, as it won't require water or be affected by ironing. Place the fabric in an embroidery hoop so the back of the fabric can press against a flat surface and color the design as desired. Use good quality crayons (Crayola works well) for the best results. Making the fill color darker around the edges is a good technique for adding dimension. As you work, don't press too hard. It's better to add layers of color than to have too much color that you can't remove. Take care to color evenly and without causing color streaks. When you're finished, place a piece of scrap fabric over the coloring and iron the paper on a high setting. This will heat set the coloring and remove excess wax. Embroider the design as desired. Tinting with colored pencil is similar to working with crayons. The result is much softer and it works well for blending color. The color is less colorfast than other tinting methods, so reserve this technique for embroidered items that won't be washed. Follow the basic crayon tinting instructions for transferring and coloring. It's helpful to hoop your fabric upside down so that you can color with the wrong side of the fabric flat against the table. Layer and blend the colors. Rubbing the coloring with a cotton swab will help blend the colors. As with crayons, different quality pencils will give you different results. You can also try watercolor pencils, then brush a tiny bit of water over the coloring. As an optional step to help preserve the coloring and make it more colorfast, brush a thin layer of textile medium over the colored areas. Follow the manufacturer's instructions. Place a piece of scrap fabric over the design and press with a hot iron to set the color. There are many types of paints and plenty to choose from when tinting your embroidery. Watercolor paint is soft and beautiful. The color usually bleeds, so if you want a crisp line, create a stencil with freezer paper. The watercolor also makes a great background, rather than a fill, and can be used for landscapes, starscapes or more. Acrylic and fabric paints have a more intense color. These paints dry fairly fast, but you can mix and blend the color if you work quickly. The paint stays mainly on the surface, so if you work with a small brush, you can paint crisp lines right up to the edge of where your embroidery will go. Place your fabric in a hoop as you would for embroidery. It acts as a stretched canvas would. Paint in the design as desired. If you are using acrylic or other opaque paints, they will most likely cover any detail lines within an area. You can either try to paint around the lines or go back and re-trace or freehand them later. When the paint has dried, place a piece of scrap fabric over it and heat set with an iron. Embroider around the painted design. Some paints dry soft and flexible. Acrylic paint, however, dries hard. If you are stitching through the painted area, bring the needle through with caution, as making excess holes will show in the paint. Just about any medium, you would use to color fabric can be used for tinting. Fabric markers, dyes, stamp pads and more are all options. Play with and test crayons, colored pencils, and paints, and then start experimenting with other techniques too. 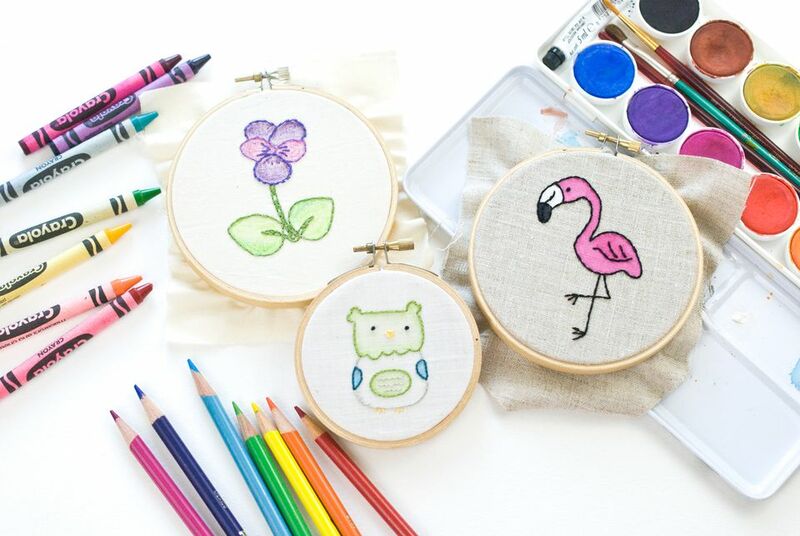 Your embroidery is about to get a lot more colorful!